As you can see my blog is a bit of a mess! My friend from college is in the process of "re-vamping" my blog into something spectacular! 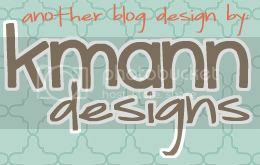 You can check out some of her designs at http://kmanndesigns.blogspot.com/. She's wonderful! Your new puppy is sooo cute! Your new blog design looks great!! I need to get back into blogging and "spiff up" mine!! Give Abby a hug from Lolly!